Our new exhibition! Open from 6th May 2010. 24th May 2010 marks the centenary of the establishment of Lonsdale District Scouts. Many of the early boy scouts saw service in the First World War all keen to volunteer for the service of their King and Country. A number of local scouts saw service with the King’s Own Royal Lancaster Regiment. Some of the items in the museum’s collection reflect their service. 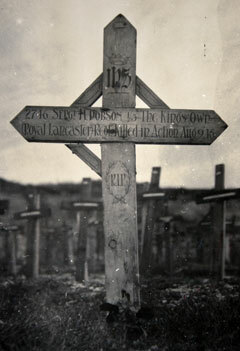 Wooden grave marker cross of Sergeant Herbert Dobson, of the 1st/5th Battalion, King’s Own Royal Lancaster Regiment, killed in action on 9th August 1916, during the Battle of the Somme, 1916. Quarry Cemetery, Montauban, Somme, France. …we publish the portraits of six members of the 4th Morecambe Boy Scouts who have enlisted in the 5th Battalion King’s Own Royal Lancaster Regiment for Imperial Service. Tom Edmondson is now at Sevenoaks, and is shortly proceeding on active service. The others are at present billeted at Blackpool with the 5th (Reserve) Battalion. 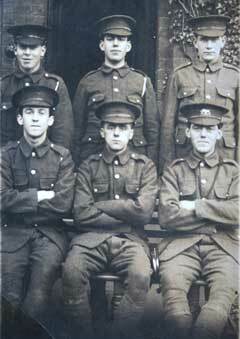 Front row:- Arthur Baron, Hampton Road, Sandylands; Tom Edmondson, Green Street; and Albert Hodgson, Green Street. Born on 20th June 1898 Arthur worked as a fisherman before enlisting in World War One. He served as number 2890 with the 1st/5th King’s Own and later transferred to 166th Coy Machine Gun Corps. He returned home after the war and worked as a sailor on board the Duke of Argyll, later becoming mooring superintendent at Heysham Harbour. He died on 19 Jan 1965 and is buried in Torrisholme Cemetery. Possibly Number 2821 of the 5th Battalion, King’s Own. Employed by T M Walker as an iron monger he enlisted into the King’s Own in September 1914 he went overseas to join the 1st/5th King’s Own in April 1916. He held the rank of corporal. He was killed in action on 15th August 1916, age 19. He has no known grave and is commemorated on the Thiepval Memorial. Enlisting in September 1914 Thomas Edmondson went overseas to France with ‘C’ Company of the 5th King’s Own on 14th February 1915. Although wounded he was able to return to duty on 23rd April 1915. He was killed in action on 15th August 1915. He was son of Mr Edmondson, Contractor and Builder. He is buried in Dive Copse British Cemetery, Sailly-le-Sec, France. Enlisted on 8th September 1914 into the 5th King’s Own. Enlisted into the 5th King’s Own. 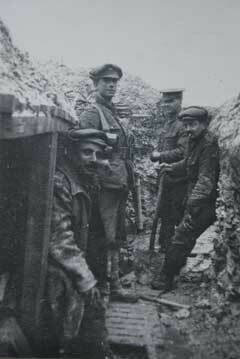 William Thompson, pictured standing looking right, one of the original Lancaster Boy Scouts, served on the Western Front with the 1st/5th Battalion of the King's Own Royal Lancaster Regiment. After the war he joined Lancaster's police force and rose to be Chief Constable, holding that post until 1947 when the City Force was merged into the County Constabulary. On display in the museum are his medals and sections of his account of his time in the trenches from 1915 onwards.